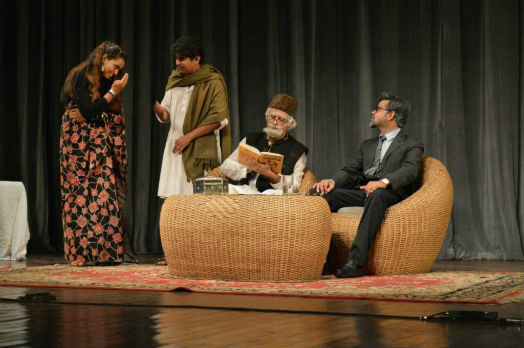 Aligarh, October 9: Attendees at the Kennedy Hall Auditorium, Aligarh Muslim University (AMU) were enthralled by the stellar show put up by the AMU Drama Club’s troupe in the form of Urdu play, ‘Zubaan Daraaz’. The two-hour drama has ageing Urdu Poet, Mirza Naseeruddin Khalik Barelvi (played by Talha Thakur) and his Begum (played by Razia Khanam) in a fix after the Begum’s rich ex fiance, Iftekhar arrives at a time when their relationship is estranged. The drama begins after Mirza proudly quotes Sir Syed Ahmad Khan’s statement that ‘it is injustice to understand Urdu as the voice of Muslims as it is a language of Hindus and Muslims both’. The begum retaliates with financial bullying saying that Mirza’s love for Urdu will not make both ends meet for the family. She insists Mirza to instead start selling kebabs. Begum is also worried about four sons, who have also turned out to be poets. She leapfrogs in future thinking that the sons will end up in poverty like father. Her anxiety grows and so does Mirza’s insecurity with the return of wife’s ex-fiance. The financial hardships take humorous turn in the spats between Mirza and Begum. To add to the worse, Mirza’s landlord wants the family to vacate their house, which he wants to use as a buffalo shelter. Mirza has not paid rent for quite some time. Finally Mirza is left wondering if Urdu poetry is not helping him to pay bills, should he consider really selling kebabs. The play ends as Mirza is forced to confess his wife that he loves her more than Urdu literature and is ready to do whatever she says. The acting was spot-on and quite impressive, the stage actors had put great efforts to deliver dialogues in chaste Urdu. The lead actor, Talha has worked in ‘Majaz’ (Biopic of Urdu Poet, Majaz) and some T V serials aired on Zee Salaam.